Our three year old daughter just came down the stairs, an hour after we put her to bed. “Reuben’s having a seizho,” she says. Nine-year-old Reuben sleeps in our room, next to his younger sisters’ room, and they are very familiar with that sound. I got up to his room moments before my husband did. It was his turn to watch the night vision camera that we keep on Reuben whenever he is sleeping so we can monitor his seizure activity when we are not with him, but Gloria found me closer to the stairs than Daddy was, so I was the one who grabbed him as he feebly tried to climb off his bed. The seizures engage the part of his brain that registers fear, and he regularly responds to the seizure ending by trying to run away from it, but he’s in no state to stand when that happens, much less attempt the escape he has in mind. When Reuben was born, we had no idea there was anything unusual about our third child. Yes, he was slow to hit some of his milestones, but I prided myself on embracing the wide range of what “normal” can include. We loved him dearly, and delighted in that precious boy. 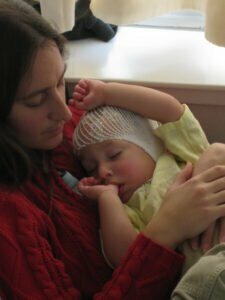 His seizures started when he was about 14 months old, though we did not recognize them as seizures at the time. It would usually happen on a Sunday morning; he would fall asleep on Daddy’s shoulder during the church service, and when it ended, would startle awake, and then slump over, not breathing, for a few moments, and then would take a big yawn and be good to go. Odd, but seemingly so minor that we just ran with it – it was always very brief, and he showed no ill effects. 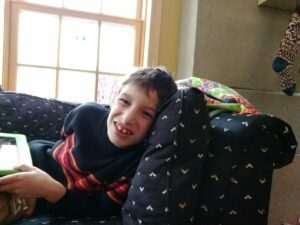 Just like that, we had our diagnosis of epilepsy, but it took another year and a half of Reuben failing to respond to the different anti-epilepsy drugs that we tried before his neurologist recommended genetic testing and we learned that Reuben has non-mosaic ring (20) chromosome syndrome. One part of me was relieved – his development, etc, wasn’t related to something that either of us had done “wrong,” but there were SO many unknowns. At the time (2012), there were still fewer than 100 cases of r(20) that had been diagnosed, and when we went to our appointment with a genetic counselor, the ONLY piece of information they had to offer us that we had not already gotten from a few websites was that if Reuben ever grows up to have children, he has a less than 50% chance of passing the ring on to his offspring, because ring chromosomes are less likely to “cross the germ line.” Everything else they had for us was just printed out versions of the same web sites we had already seen. And thus began our personal adventure of trying to figure out what works best for Reuben. Various other trials of different medication combinations have not worked. His “normal” is to have about 5-7 days without seizures, and then to get pounded, requiring valium to cut the run of seizures. We have, at times, had periods of weeks-long stretches where Reuben has had no measurable seizures, but also have had one horrible stretch where for over three months, he had daily seizures, and during that time he lost a significant amount of weight because his appetite tanks when he has increased seizures, and regressed in many areas of his development – communication, physical abilities. We are still, over a year later, trying to regain some of what he lost. Our vision of Reuben’s future is very uncertain. 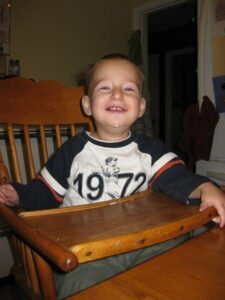 We know that he, with uncontrolled seizures, is at a much higher risk of early death. We anticipate outliving him, and in many ways that comes as a relief as we know that we will always be around to care for him. He is significantly developmentally delayed. His speech is very limited – we can understand more than most people can because we know his routines and interests, but even with that, most of his communication is in the form of single word approximations. Wa-duh (water). Bown (brown – meaning chocolate milk). Ma-boh (marble). Bi-boh (Bible). He was three years old before I heard that beautiful word, Mommy. Reuben wears diapers, and is oblivious to the fact that it’s not proper to fill them in front of others. He grinds his teeth incessantly, except for when he’s sucking his thumb. That poor thumb is so scarred from getting caught during seizures. He thrives on repetitive activities – running marbles down a run for hours, stacking blocks, lining up toy cars, listening to his favorite books – almost all of us in the house can recite his two dozen favorites at will. Caring for Reuben is an all-consuming task, but we love this precious little boy fiercely. We have been so grateful for the network of other parents of r(20) children, as this is our thin thread of any attempt to try to take steps to improve the quality of life that our son has. One thing that is very challenging about r(20) is that each person responds so very differently to the different medications and interventions that are available. What works for some actually exacerbates the seizures in others. Some things make no difference. It’s hard to know what he’s actually taking that helps, and what is just benign. There are days when it feels like I’m poisoning my son as I give him his meds (currently depakote and felbatol). 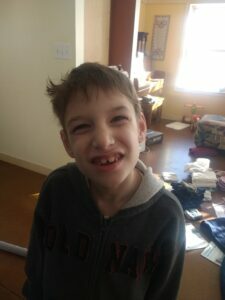 At this point, even research that would help to make any sort of reduction in his seizures would be meaningful, obviously for his quality of life, but also for the rest of our family. We are grateful for the opportunities Reuben’s siblings have to learn compassion by growing up with their brother, but also know that it puts a lot of weight on young children to know inherently that they, too, have a role to play in caring for their brother. As it stands, we are grateful for every day that we get to have with this special little boy, being reminded daily that we never know which day is going to be the last.